From February 10 to the 14 I had the joy of visiting the Carmel of Pt. Tobacco, Maryland for the first time. This community of prayerful women is located in the same site where the first Carmel in the US was founded. 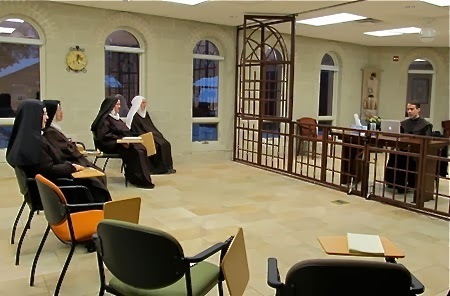 I went there at the request of the sisters to give them some conferences on St. John of the Cross, specifically on the topics of the Holy Spirit the the value of holy desires in his writings and spirituality. As it is habitual with our Carmelite Nuns, they outdid themselves in hospitality, generosity and kindness. I stayed at their very nice guest house. Always attentive in the care for others, the sisters made sure I was well provided for by stocking with all kinds of goodies. Fortunately my visit was not during Lent since I could not resist the delicious and various kinds of ice cream they left for me in the freezer! Not even the heavy snow or the freezing weather stopped me from this. 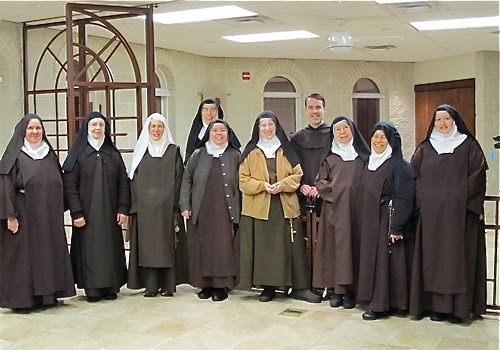 I was very glad to see some of the sisters that I had already met in different Carmelite conferences we had attended in the past. Among them was Sr. Ana, whom I later realize is a distant cousin of mine! It is always a great joy to be called to plant the seed of God's Word on soil that is so rich as are the hearts of these remarkable and dedicated women. I frequently wonders who is teaching who. As a Discalced Carmelite friar I am constantly humbled to see that what I have learned through studies and books they already live and know intuitively by their closeness to the Heart of Christ. They say they are edified by my talks, but I am more edified by their witness of life.